The purpose of this document is to detail the installation and configuration of a Sea Tel Antenna Controller Unit (ACU) for use with Uplogix Local Managers. There are two connection points from the Sea Tel ACU (M&C and NMEA) to the appliance. The M&C connection is used to interactively manage the Sea Tel ACU and PCU. The NMEA connection is used to collect GPS information in NMEA-183 format from the Sea Tel ACU. Both M&C and NMEA information may be retrieved from the M&C port. The NMEA port should be used when the M&C will be utilized for extended interactive user sessions so GPS coordinates can be collected without interruption. The M&C port on the Sea Tel ACU can be connected to the Uplogix Local Manager with standard CAT5 cables and DB-9 to RJ-45 adaptors. The M&C port requires a rolled cable and the NMEA port requires a straight through cable. The default baud rate for the Sea Tel M&C port is 9600 on DAC 2202/2302/2200 series and 4800 on DAC 03/97 systems. The Uplogix appliance will need to be configured with the appropriate rate. The default baud rate for the Sea Tel NMEA port is 4800. If this value has changed, the Uplogix appliance will need to be configured with the new rate. The ACU’s Serial M&C port does not require a username or password, although the initialization routine will ask for them. Bypass this prompt by hitting the return key. Open a connection to the Uplogix appliance and navigate to the port you wish to initialize. Use the config init command to configure the port for use with the M&C port on the Sea Tel ACU. The make should be SeaTel and the OS DAC. Model and OS version are optional fields and will be populated automatically as part of the config init process. Press [Enter] when accepting default values. When the config init command completes, run terminal to open a terminal session with the Sea Tel. If the port has been properly configured, you will be able to interact with the ACU using standard M&C commands (ie. “S” immediately returns the Status). If you are not able to interact with the Sea Tel ACU using the appropriate command codes, ensure that the physical connection is correct and that the serial settings on the Uplogix appliance match those on the Sea Tel ACU. Use the escape sequence (~[enter]) to exit the terminal session with the ACU. The NMEA port should be used if NMEA formatted GPS is distributed to various services such as location coordinates to a modem or a location tracking program. 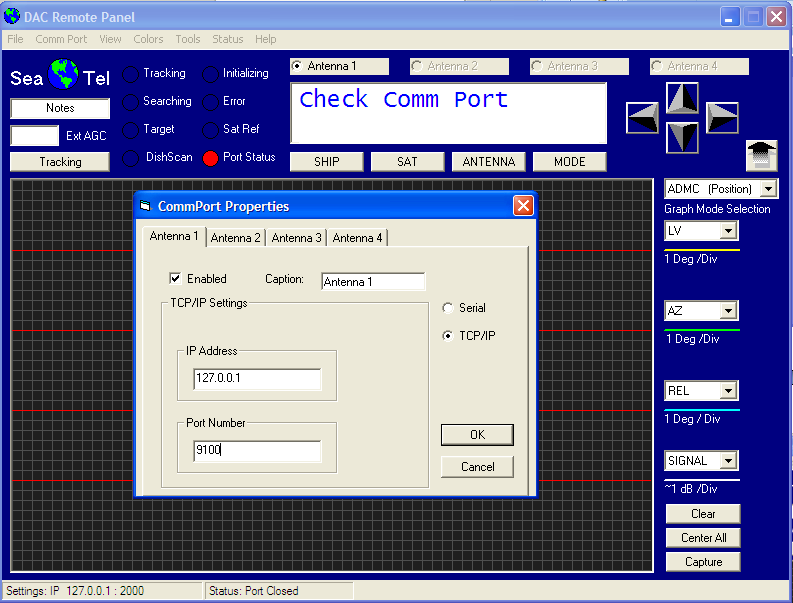 Use the config init command to configure the port for use with the NMEA on the Sea Tel. The make should be SeaTel and the OS NMEA. Model and OS version are optional fields and will be populated automatically as part of the config init process. Automated jobs are scheduled using the assigned default intervals during the config init process. For the Sea Tel ACU, these jobs include pullRunningConfig and deviceInfo. The deviceInfo job queries the Sea Tel ACU for information fields such as hostname, make, model, and OS version. By default, this job runs every 5 minutes. To view the collected data, use the show info command. The Sea Tel ACU has one configuration file that is pulled by the pullRunningConfig job and is stored on the appliance as the running-config. To pull this file manually, use the pull running-config command. The Sea Tel ACU driver includes support for Surgical Rollback™, but is disabled by default. When the terminal command is run, the LM will pull the device configuration before giving control to the user. After the terminal session is closed, the device configuration will be pulled again and compared to the original. If any changes are detected, they will be reported in the device changes log and displayed to the user. If Surgical Rollback is enabled, uncommitted changes will be rolled back. To schedule the monitors for the Sea Tel ACU, navigate to the port of the device to be monitored. Use the config monitors command to schedule the specific monitor. GPS information is now being monitored. Remotestate information is now being monitored. To display scheduled monitors, use the show monitors command from the port. The result will display index number, time interval and mask, interface name, applied rules, and delay time. 10/05 30d 22' 00.000" N 97d 46' 00.000" W         Assimilate completed. 10/05 30d 22' 00.000" N 97d 46' 00.000" W         Pull running config completed. 10/05 30d 22' 00.000" N 97d 46' 00.000" W         User started a terminal session. For more information on the DAC commands utilized to collect the information in the driver monitors, please refer to appendix A of this document. The Sea Tel driver offers several advanced features for interacting with the Sea Tel antenna system. This section describes upgrading a Sea Tel DAC or PCU, displaying additional system logging, and interacting with the DAC directly. Not all versions of Sea Tel DAC and PCU code are compatible with all Sea Tel hardware. Ensure that the version of code you are upgrading to is compatible with the hardware. Upgrading the DAC or PCU to non-compatible code could place the Sea Tel in an unrecoverable state. CommIF module upgrades are only available on CommIF software versions 1.12 or later. Upgrading from a previous version will display an error. The Sea Tel advanced driver supports upgrades to the DAC, PCU, and CommIF module. CommIF upgrade requires CommIF software 1.12 or later to function. All components may be upgraded separately. Prior to upgrade, it is a best practice to stage the current working version of the ACU, PCU or CommIF code in the Uplogix’ target port directory in the event that a recoveryis necessary. A total of six named files can be stored per target port. To upgrade, first stage the new operating system image(s) on the Local Manager. There are several methods to stage the operating system image. In the below example, the file “DAC-2202_606.s19” in category “OS” is copied from the Uplogix Control Center “ems” to the appliance file archive in the “os” directory. After the copy is complete, the file will appear in the appliance’s directory for that port which is viewable using the show directory command. where Version is the name of the OS, in this case DAC606. As part of the push OS command on the Sea Tel driver, the Uplogix automatically detects the type of OS image (ACU, PCU, or CommIF) and upgrades the correct hardware. Note it is normal to see exclamation points (!) or the letter S in the output during the upgrade process. An exclamation point (!) indicates a protected sector the bootloader is not able to write against and an S indicates a slow response from the PCU during transfer. The PCU is upgraded via the same commands as the ACU. The upgrade of the CommIF module utilizes the same push OS command, but in addition to CommIF software, requires specialized bootloader software available from Sea Tel support. Please contact Sea Tel support by phone (+1 925.798.2399) or email satcom.concordsupport1@cobham.com for assistance with CommIF upgrades. When the port is configured as a Sea Tel, the system will log information on DAC status. DAC status is collected with the DAC status monitor command S. The driver captures status information and translates status words into human readable text. The output of the Status messages can be evaluated to customize the Uplogix dashboard display for the Sea Tel port, triangulate a known error condition or forward a syslog message to a network host with the output. Log buffer clearing needs to be enabled to use forwarding. The DAC Remote Panel (DacRemP) remote access feature allows the user to utilize Sea Tel’s DacRemP program without physical access to the Sea Tel DAC. Use of this feature requires DacRemP software version 1.01 or later. There are two methods to utilize the appliance to populate the data required in DacRemP: Asynchronous modem connection and serial port forwarding. For both methods described, the workstation’s TCP/IP loopback (127.0.0.1) interface is utilized. 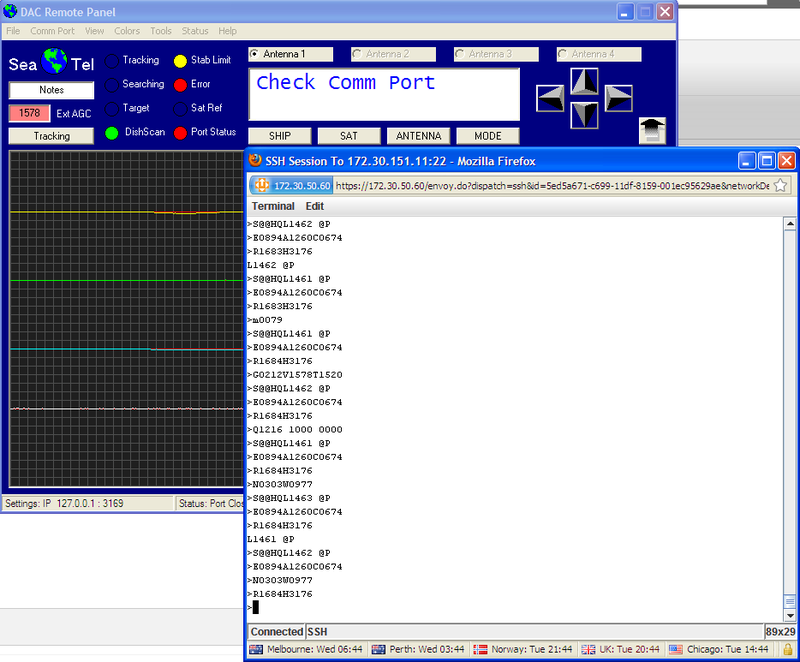 An available local port is presented and configured in DacRemP. The Asynchronous modem connection method is best used in deployments with an Uplogix Control Center whereas the serial port forwarding method requires no Control Center. Last Alarm displays time since last Alarm matched. Active alarms exist. Email notification is suspended while you are logged in. Press 'x' to exit or 'f' to force (use carefully). Console session started. Press ~[ENTER] to exit. Once the terminal session has started, initiate a forward to DacRemP. On the Terminal menu of the CLI applet select Forward. An open port is selected at random or the user may select an open port. The green colored background of the port number indicates the port is available. A red colored background indicates the port is not available and another port should be selected. Once the port is selected click the Apply button. Next, launch the DacRemP software. On the CommPort menu select Properties. Set the IP Address to localhost (127.0.0.1) and enter the Port Number configured in the previous step. In this example the port number is 9100. As DacRemP queries the DAC, the commands are displayed and logged in the terminal session window. As long as DacRemP is functioning, the port will not time out. If you would like to interact with the terminal session directly, simply close the port by clicking on the Port Status radio button in DacRemP. The radio button will change from green to red. You can then enter DAC command codes directly in the terminal session window. To reopen the port click on the Port Status radio button again and the connection will be re-established. The serial port forwarding method is useful for deployments with no Control Center. Follow the instructions in the Feature Guide Serial Port Forwarding available on the Uplogix support website (www.uplogix.com/support) to set up forwarding using PuTTY. Now all interaction with the DAC M&C port is being forward to the workstation’s localhost address (127.0.0.1). Next, launch the DacRemP software. On the CommPort menu select Properties. Set the IP Address to localhost (127.0.0.1) and enter the Port Number configured in during port forwarding setup. As DacRemP queries the DAC, the commands are displayed and logged in the terminal session window. As long as DacRemP is functioning, the port will not time out. If you would like to interact with the terminal session directly, simply close the port by clicking on the Port Status radio button in DacRemP. The radio button will change from green to red. You can then enter DAC command codes directly in the terminal session window. This ruleset is to be scheduled as a remotestate monitor on SeaTel DACs. 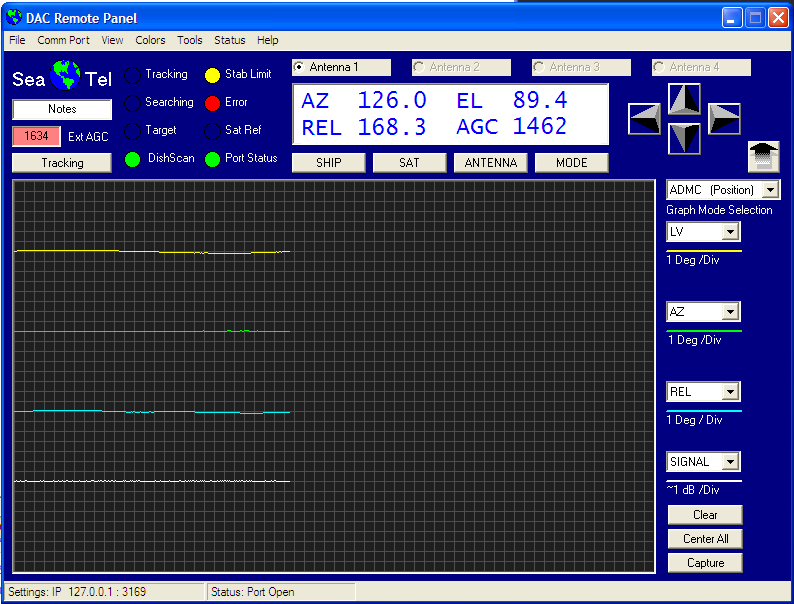 It displays if the SeaTel is has Tracking On or if AGC is below threshold to the dashboard as the status of the DAC. action alarm -a "AGC Below Threshold"
Additionally, this consoleLog rule that looks for "Tracking On", that can be scheduled in addition to the seatelNative ruleset with the command config monitor consoleLog seatelTrackingOn. The following remotestate rules are an example of blockage zone rules. The "NearBlockage" rule's azimuth are set slightly larger than the actual blockage zone, and send an alarm when within that azimuth. The "InBlockage" rule's azimuths correspond with the actual blockage zone. When in the blockage zone, this rule brings up the out of band connection to report that alarm back to the Control Center. To schedule the ruleset on your Sea Tel, run the command config monitor remotestate SeatelBlockageZone. action alarm -a "Approaching Blockage Zone"
action alarm -a "In Blockage Zone"
The Uplogix Sea Tel driver utilizes DAC command codes to collect information for monitors and device configuration. Below are the commands the appliance utilizes to query the DAC and PCU.